From February 9th to 13th I, along once again with Ed from IceClimbingJapan (but not in a guiding capacity this time) took a trip out to Kaikomagatake in the Minami Alps (southern Japan Alps). No lodge this time! 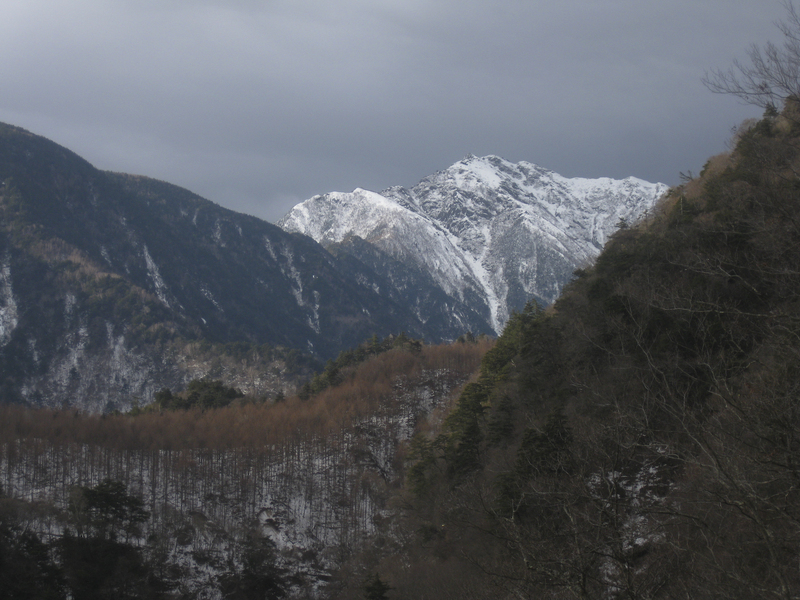 Kaikoma is pretty remote - something of a frontier of winter climbing in Japan, with only a handful of climbing teams really going there each year. You really have to be totally self-supported. A lot of the area is totally unexplored from a climbing point of view, so that was our objective here - go in, see what's there, and climb some of it. Conditions were promising. 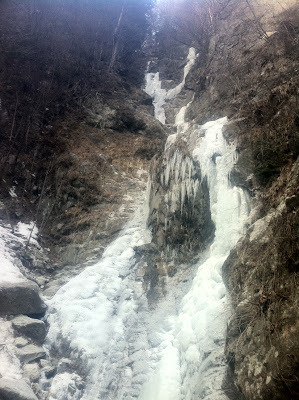 In the days leading up to the trip temperatures experienced a bizarre spike, reaching well above freezing and coupled with some quite heavy rainfall (rain, not snow!). The temperatures then plummeted back to their usual sub-zero values in the following days. 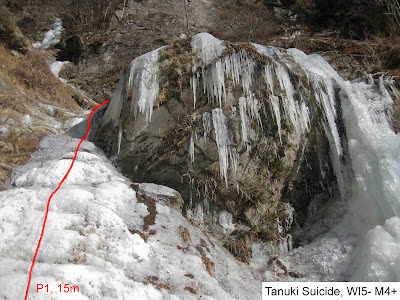 This meant that there should be lots of fresh, well-formed ice and the rain would also have removed lots of the surface snow - often a big obstacle for access. Somehow all packed and ready! On Day 1 we took a really early start and walked in from the nearest roadhead (we went as far as the taxi driver would take us). The first part of the walk-in was hilariously easy - along an abandoned road built into the hills. Bit of a mystery what it was doing there, actually. My guess is that it was an access road for some construction project (hydroelectric power, maybe) but it's still quite bizarre. 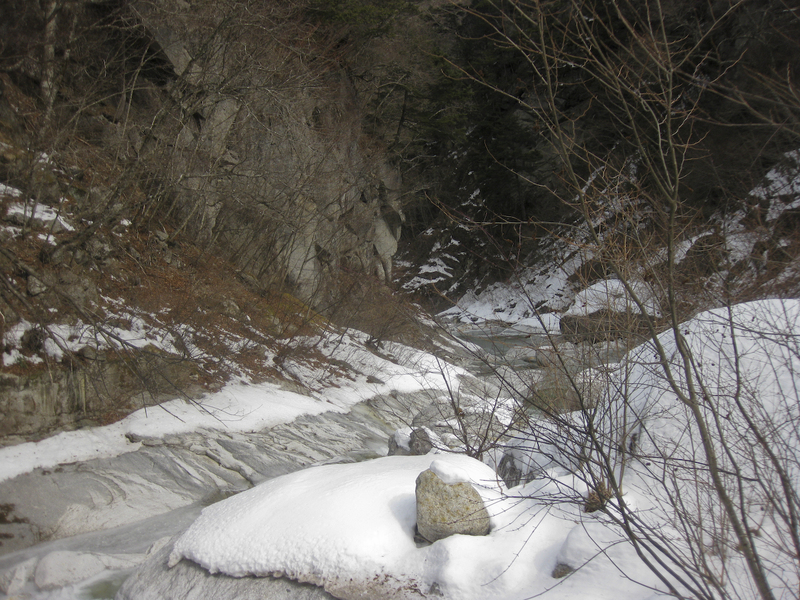 After reaching the end of the road (it literally just ends) we headed down a steep slope (with the aid of some fixed ropes) and into the approach valley proper to Kaikoma. Here the going got really tough. 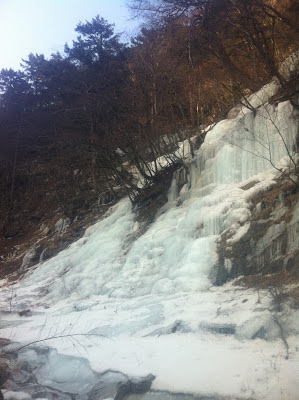 Numerous times we had to cross rivers in various states of freezing. 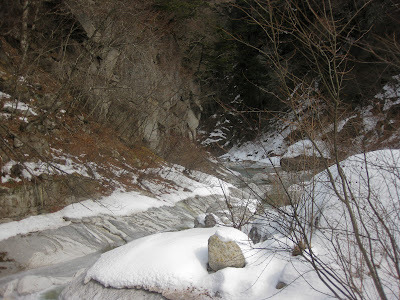 The river was bounded by cliffs and broken by waterfalls (unfrozen!) which meant we often had to climb up onto the banks to get any further - not an easy task with heavy packs and thick foliage (which seems intent on snagging absolutely everything it could). At some point in the mid afternoon we both agreed that it was getting tough and that we were wasting time. We'd already passed lots of potential climbs so we decided to head back to one in particular and give it a shot, then bivvy there for the night. Pitch 1 of the climb turned out to be... interesting. After being in the sun all day the ice was in pretty poor condition and that made things a little hairy. 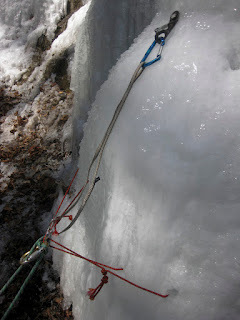 The climb wasn't easily protectable - one poor screw in some slushy ice and a piton tapped in halfway and then tied off with a sling (a real "Andy Kirkpatrick special"). We continued up onto pitch 2, which was mainly rock and turf - not brilliant either - but realised that we couldn't easily get across onto the ice. Eventually, with darkness closing in, we abseiled off and vowed to come back and try it again via a different route. 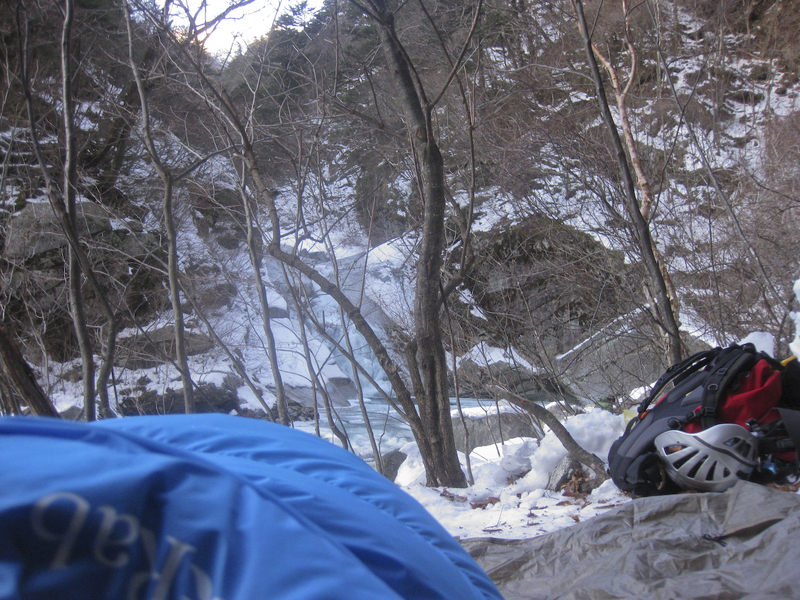 After coming down we set up a surprisingly comfortable open-air bivvy tucked at the base of a cliff near the falls. Temperatures probably got down below -10 C but we were quite comfortable in just our sleeping bags (and Thermarests) on a tarp. 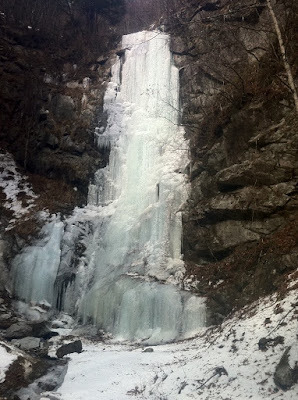 Day 2 was a climbing non-event but yielded a lot of new ice that has quite possibly not been seen or climbed before. We pushed on a little further up the river but again, with the surface being largely unfrozen, the going was incredibly slow. Plenty to come back for next time, though! We pushed on as far as we could, then decided to just make the most of what we'd already seen. We went back and bivvied where we did the previous night and planned to climb our previous route again first thing in the morning, before the sun melted it away too much, to completion. Day 3 was dominated by the new route. 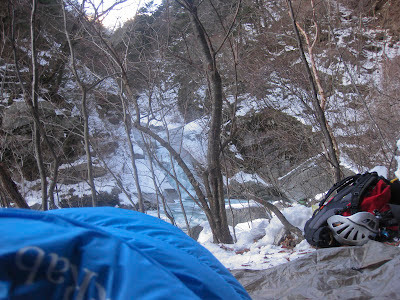 By the time we were finished we were both wiped, physically and mentally - enough climbing for one day! For pitch 1 we took the same route as last time - the left-hand fall, which began with some nice fat ice and ended with thin, flaky ice over wet rock with a little bit of unfrozen turf thrown in. 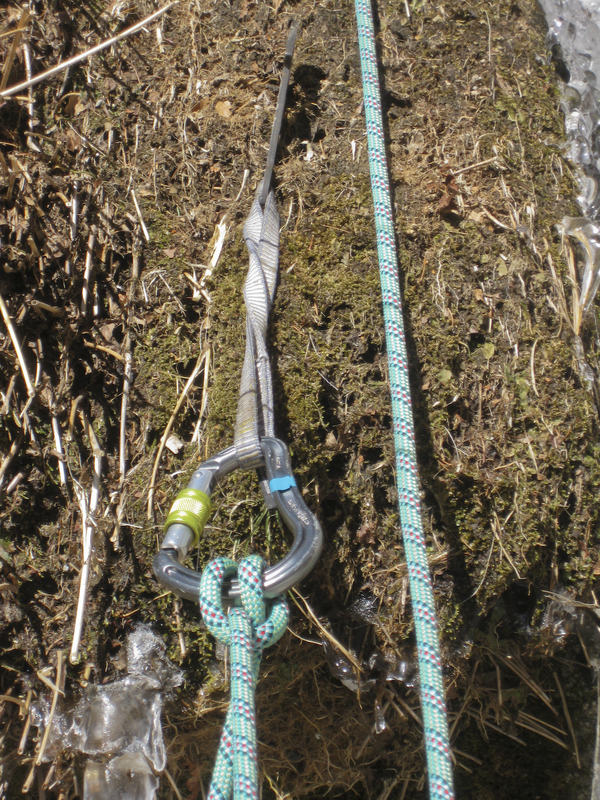 Belay 1 is a spectre in turf - hardly ideal! Pitch 2 was a total horror show. 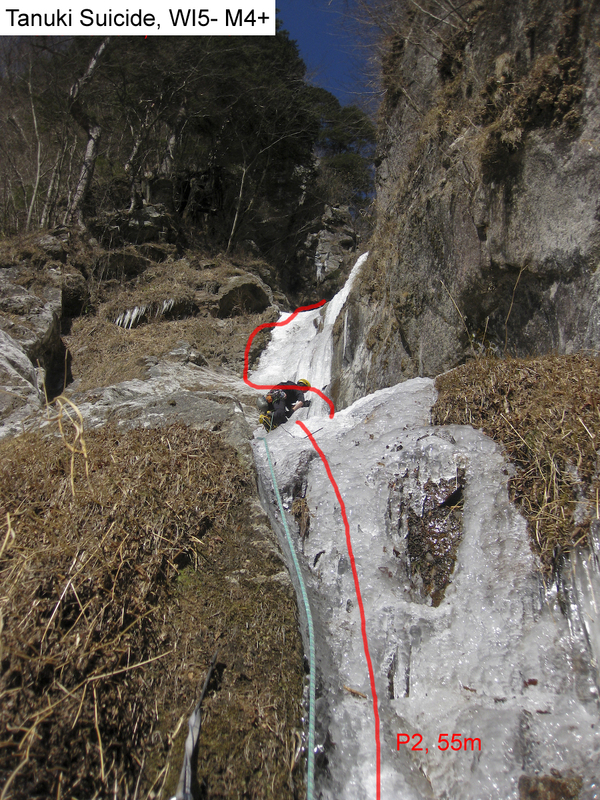 Belaying Ed up was bad enough - both his upwards progress and the rapid thawing of the route as the sun hit it (both melting ice and thawing turf/rock) caused frequent falls of huge chunks of ice and rock. I was belaying from a sort of corner and couldn't wedge myself far enough into it! I counted three good hard impacts on my helmet from that alone. 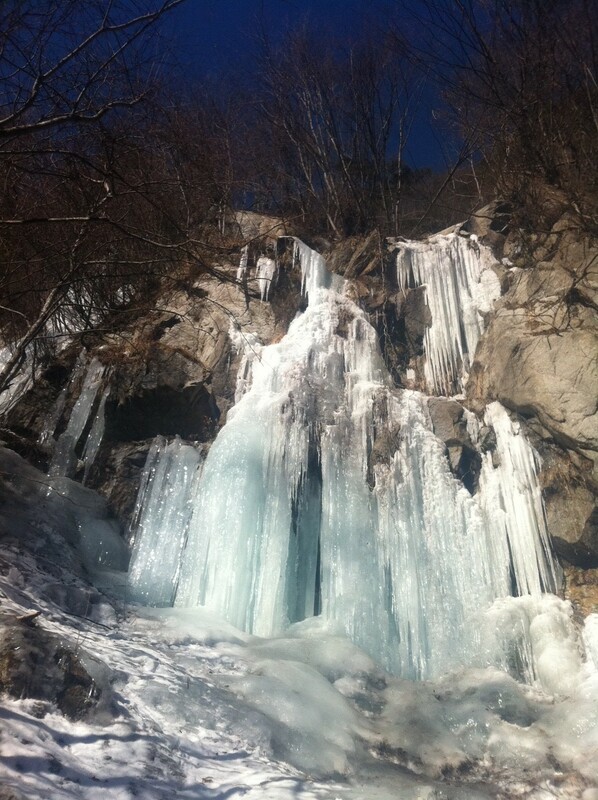 The lovely ice I kept looking up at, hoping I could get onto soon, gave way. Twice. The first collapse came rushing down towards me, funneled by the channel I was standing in. All I could do was brace myself. It hit, a little wall of ice, painfully slamming big blocks of ice right into my shins and knees. Somehow both my feet and tools held. Stepping through the debris I started upwards again, when the second chunk gave way. An even bigger collapse, this one just blew my feet right out from under me. 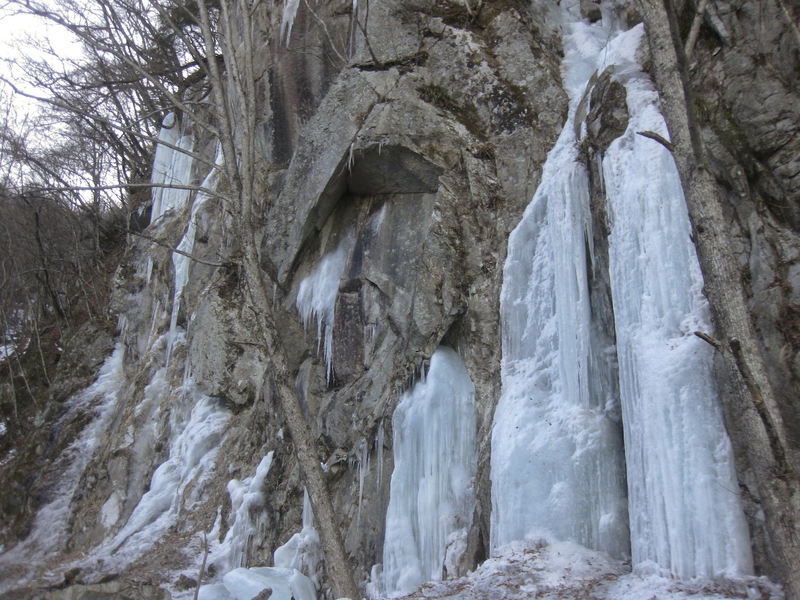 Luckily I had good tool placements in a smear of ice on the right and they both held, but I was left desperately scrabbling for footholds on slabby granite for a few seconds - unable to see because everything was covered in blocky ice and snow and with my shins screaming at me. 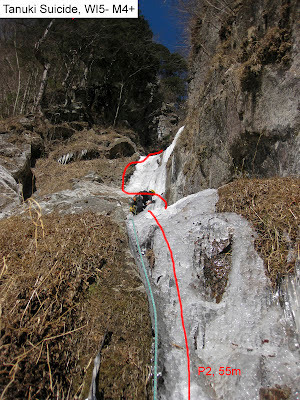 After getting established again I resolved to get the hell out of the path of any more collapses, so I traversed right onto the utterly blank granite slabs and made very slow progress upwards (pure drytooling with more crampon smearing than anything else) to some more turf. From here I traversed back right onto the top of the icefall that had collapsed onto me (that was a pant-shitting moment, rest assured...). 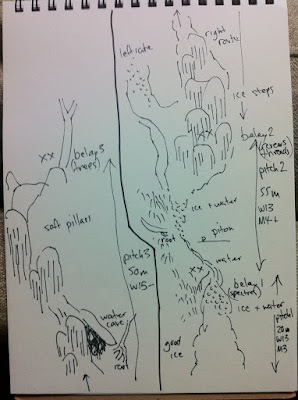 Every tool and crampon placement yielded a hollow sound and you could hear rushing water under the ice - it was clear that it wasn't going to be there long! I don't think I've ever climbed so quickly from there to the belay... I was utterly desperate to get off that ice before it all went! Belay 2 was a pair of passable V-threads in nice fat ice. Much better! Pitch 3 made it all worth it! A nice rewarding 50m section of steep ice, lovely and plastic giving good placements and even reasonable screw placements. Lovely climbing. Belay 3 is a set of decent trees, which also make alright abseil anchors. Descent is by abseiling more or less back down the route in 2 or 3 pitches. All in all an exciting route! Fun? In a "Type 2 Fun" sort of way, sure, but at the time maybe not so much! During both the climb and descent we saw absolutely no evidence that anyone had ever climbed it before - no tape on trees, pitons or piton marks, scratches, abseil tat or anything else. Therefore I think there's a reasonable chance that this was a first ascent of a new route - I guess it will never be proven, but for now it's a reasonable assumption. 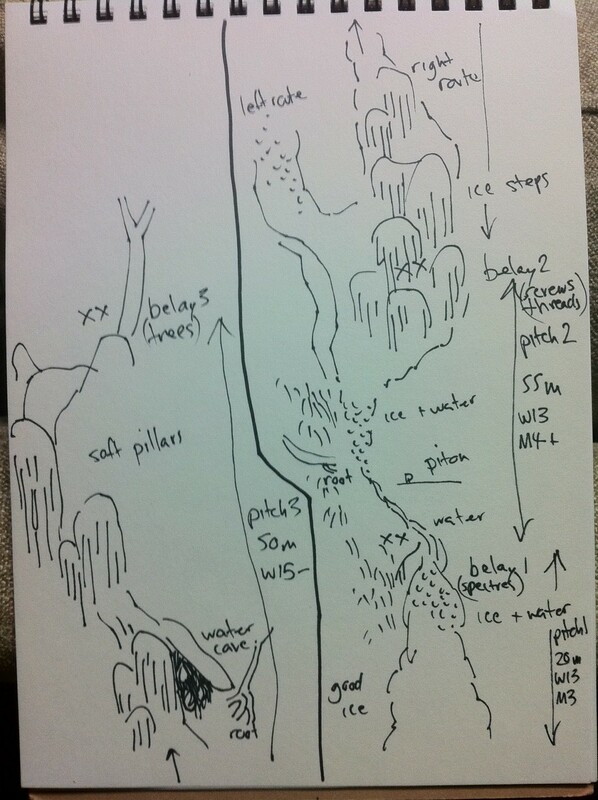 Therefore, we get to name and grade the route. Why 'Tanuki Suicide'? 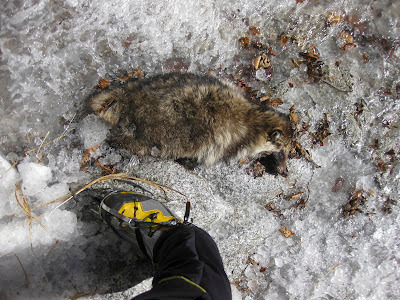 Because of what we found at the first belay ledge - a tanuki (Japanese raccoon-like animal) that appeared to have simply fallen from the sky. Very strange. It made naming the route easy, anyway! 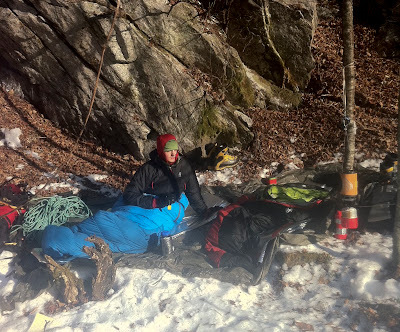 After climbing and descending the route we had lunch, packed up our bivvy site and pressed on back up to the road we walked in on. 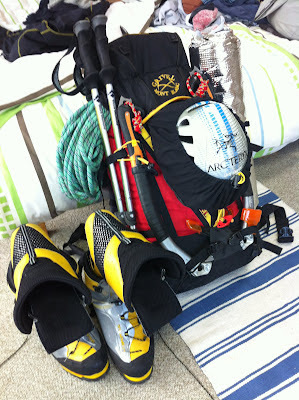 No more climbing today, but it put us in a good position to get lots more done the following day. 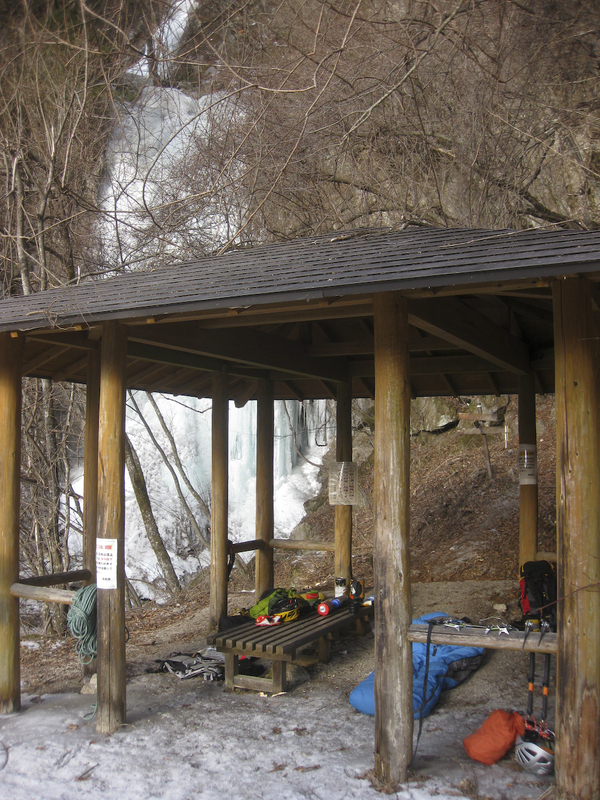 We slept in a hut near a gorgeous fall - relative luxury! On Day 4 we first headed down from the road to check out some of the mostly unseen ice down there. 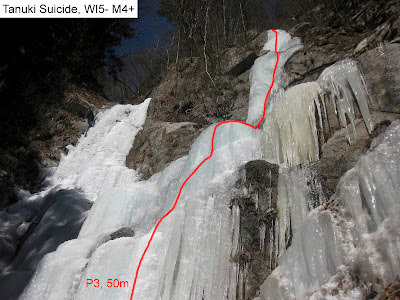 Ed climbed one route but ended up backing off due to sugary, frazzled ice (the sun was already doing its evil work) and frequent small ice collapses. After scrambling back up to the road and having a snack we hit up a popular climb (well, it's in the guidebook!) - Gun-Ma Taki F1, WI4. Only one pitch, but really nice climbing, even if it was a little stepped-out by this point (we'd seen other teams on it both days). 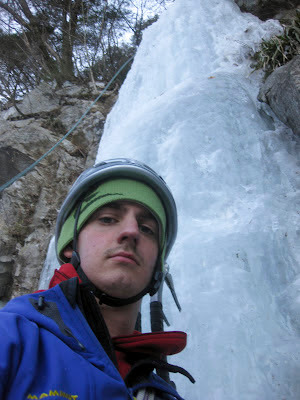 There are apparently more pitches above but nothing looked in condition so we abbed off. Finally we headed back to an area of promising-looking mixed climbing. Sadly it was dripping, so we decided to see if it would freeze back up and instead concentrated on two lovely steep ice pillars to the right side. The ice was hollow and actually detached from the rock at many points, and too thin to be easily protectable, so we top-roped it anchored from a tree at the top (good effort by Ed for soloing up a neighbouring fall to set up the top rope!). The left pillar probably goes at WI4 and the right at WI4+ (it's a little steeper). By the time we'd finished messing on these the mixed routes were still dripping and we were both feeling pretty worked so we called it a day. Back to the bivvy shelter! We walked out and we were back at the trailhead by about 11am. Nice and easy. As we came out we could see the snow rolling in over the mountain, so I think we made a good decision - the snow could have turned to rain lower down, too, which would have made the walk out utterly miserable. The early start meant I could skip the return stay in Chino, so I moved the train ticket and I was back in (a very wet) Kyoto by mid afternoon. Kaikoma is totally different from Yatsugatake. 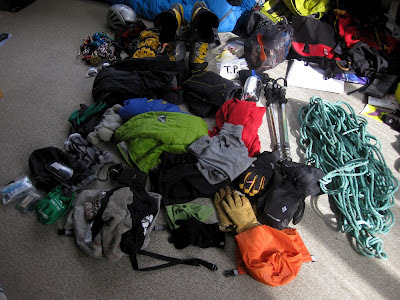 It's remote, it's unforgiving, access is harder (or at least it was this time) and there is a LOT more to climb. A lot of it's still unknown. 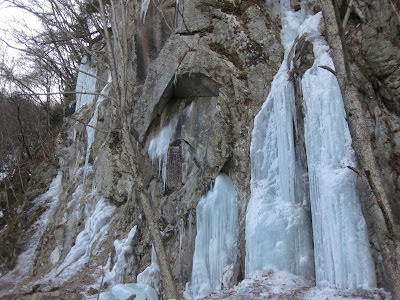 The trip didn't go quite as planned but we found lots of 'new' ice, got lots of ideas for the future and got plenty of climbing done including what is quite possibly a new route. That's not too bad, if you ask me!